SUMMARY: There’s none so blind as they that won’t see. Though definitely overdramatic at times, and a little convoluted at others, there is still a strong emotional element and intensity in Blind Spot that will keep readers hooked. This is one of those books that is like crack, completely addicting even when you might get frustrated. 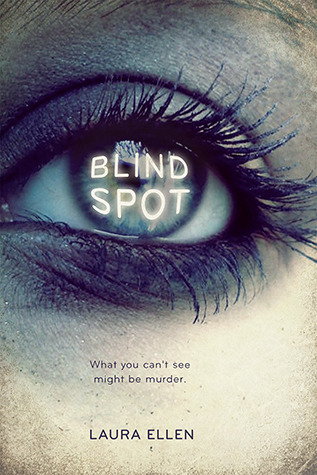 With a fiery main character, though, and an intricate murder plot weaving throughout, Blind Spot is a quick read with a great payoff. Roz is a spitfire, a girl who is so determined she is stubborn to a fault and even selfish. Furious at being put in Life Skills with the other disabled students, and refusing to admit that her eye disease is a disability of sorts, she comes off strong and self-sufficient at the start. As the story progresses, though, there are times when she is hard to like and get behind, particularly the cold and selfish way she treats Greg, a guy who doesn’t care that she’s legally blind and who has such an honest, sweet crush on her. Having been flirted with by Jonathan, one of the jock heroes in the school, Greg is simply not good enough to her. Even when Jonathan proves to be an uncaring player, and cheats on her almost openly, Roz still lets him draw her in and sweet talk his way out of things. While I can understand that happening once, it’s a few times, and Roz is so adamant that she and Jonathan were a couple when no one else seems to think, Jonathan included, that it gets both frustrating and a little tiring as a reader. This bleeds into her friendship with Greg, who doesn’t have the patience for it either and while I completely respect that about him, the overdramatic fights that often ensued and the silence between them that resulted, more than once, dragged me down a bit. Still, Roz has a great character arc, with plenty of realism to it, even if some of it felt too overdone. Ellen has written her character in a sympathetic but not excused way, yet goes far to let readers know that not only is Roz fighting bigger battles, even some that are only in her head because of her eye disease, but she also comes from a house where her mom is basically a drunk who sees Roz as nothing but a source of income because of the social security checks she gets. The way Jonathan makes her feel, special and beautiful and wanted, takes such a strong hold in her that even when I wanted to smack her and tell her to figure it out, I did understand why she kept letting him pull her back in. And while I had a hard time understanding why and how she got wrapped up into the entire drug aspect of this book, I do think Ellen has crafted a character who is so determined to do everything on her own that she ends up hurting herself far more. Even with my issues with Roz, I completely admire Ellen’s characters, who have strength and depth to them at varying degrees that fit the book perfectly. From intense and kind but strung out and messed up Tricia to so with it he almost doesn’t belong at that school Greg, and a range of characters in between, Ellen has crafted a memorable and powerful cast. Each character has a different impact on Roz, going far to develop her character and guide her without taking away the strong sense of independence that she has. With plenty of twists, and misleading clues, and a gutting climax, the plot of this one is intense and almost nonstop. Almost too intricate, feeling convoluted at times, the moment where everything comes together has that holy crap kind of feeling that will last. While a few aspects of the plot tested my suspension of disbelief in a not so good way, Ellen still did a remarkable job of not only building the mystery but playing everything out as well. With plenty of damages on the way, and having a different kind of romance built into it, the plot of this one is strong despite its smaller flaws. Strongly written, vivid in voice, and holding a good mix of rough and tender, Blind Spot is a great book from a promising writer who I definitely will look for more from. The best sitebook reviewer us.